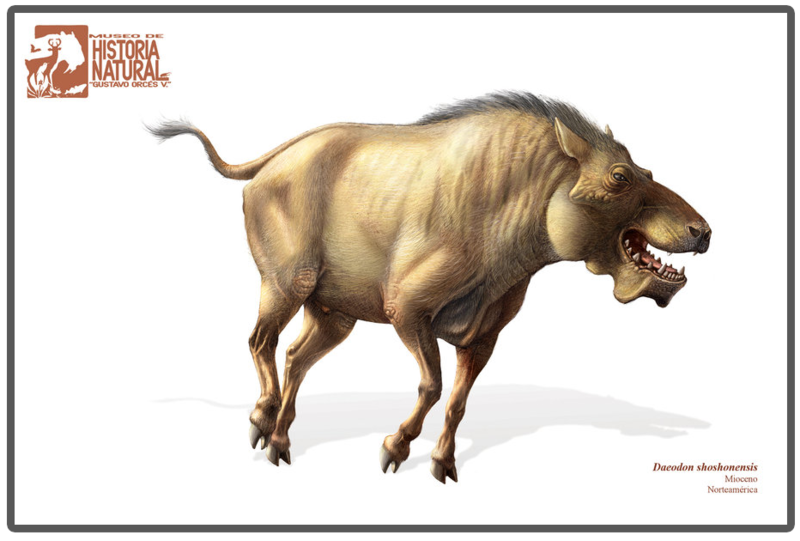 Grubbing around the plains of Oligocene North America, lived a chimeric beast of pig, bison, and dog-like qualities. This massive beast could go toe-to-toe with an American bison and tear it to shreds with its massive teeth and bone crushing jaws. 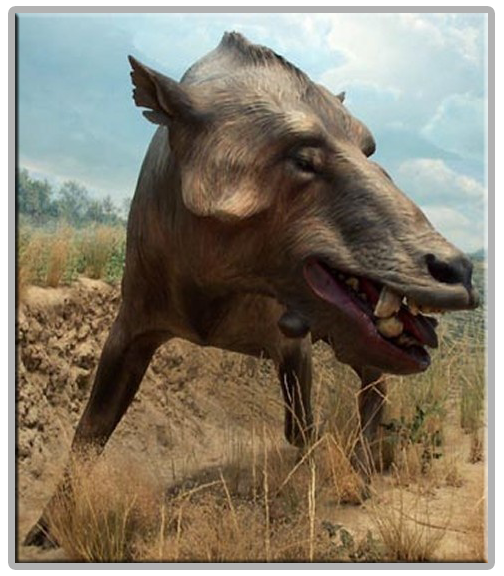 This terrifying hell-pig, is the mighty, Daeodon! The Oligocene was a time of transition. 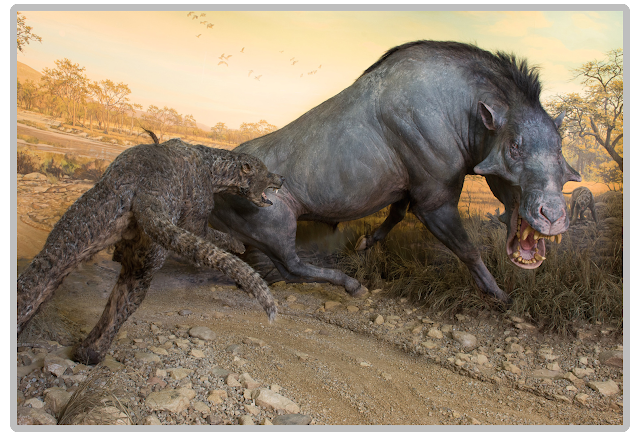 Animal forms were changing from the weird and wonderful experiments of the early Eocene and Paleocene, to the more familiar forms of the Neogene and Quaternary. There were many mammals with a strange mix of characteristics we see on our world’s modern inhabitants. 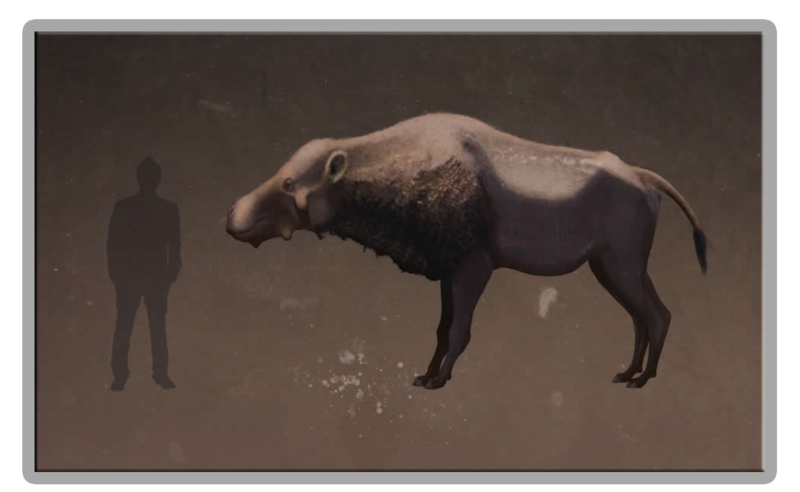 There were long-legged running rhinoceros, which produced the largest mammal to walk on land, Paraceratherium, and there were strange dog-like animals with an appearance much like marsupials but completely unrelated, and of course, the entelodonts. 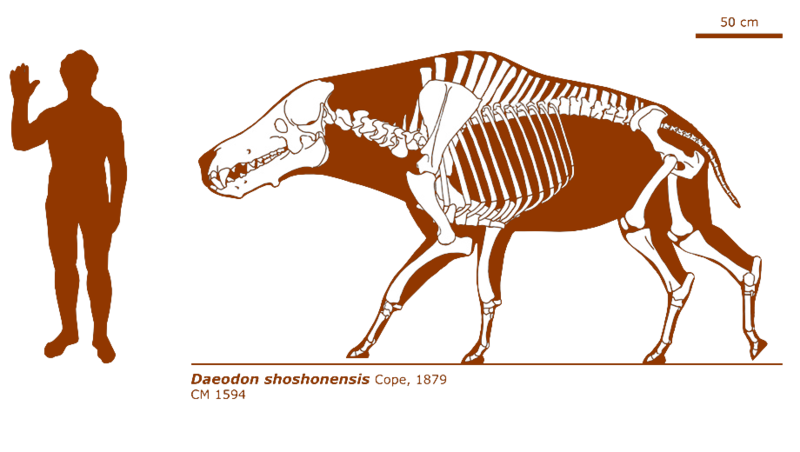 Entelodonts were a group of large pig-like animals belonging order Artiodactyla. This group also holds whales, pigs, and hippos. These animals were rather chimeric in appearance. Most of them had Bison shaped bodies with tall neural spines that would have held muscle and fat in life. 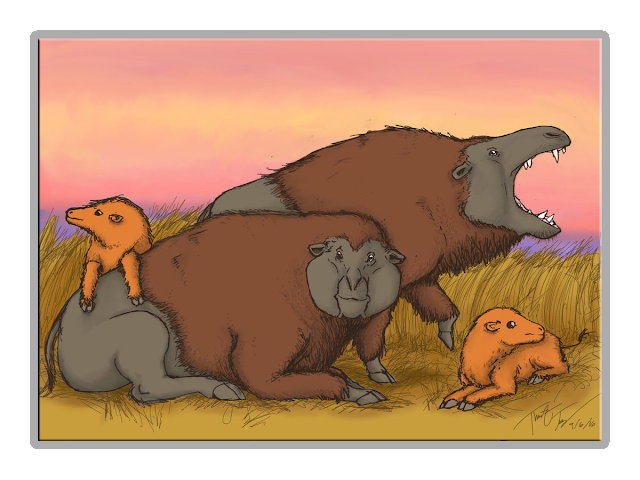 Daeodon was the largest of this group of animals. There are two species of Daeodon known; D. shoshonensis, and D. humerosum. 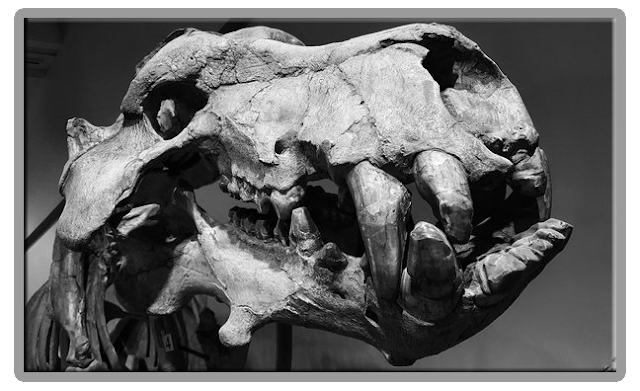 Daeodon material was first discovered and described in the 1800s, by famed paleontologist Edward Drinker Cope and were uncovered in the John Day Formation of Oregon. Cope’s infamous academic rival, Othniel Charles Marsh, later uncovered more material. However, due to their rivalry and the scientific practices of the time, Marsh named his specimens Dinohyus hollandi and Ammodon leidyanum. These were found in the Agate Springs quarry of Nebraska. Daeodon lived all across what is now the United States, but was not very abundant in the ecosystems it inhabited. This animal exhibited a large head; the skull could reach lengths of up to 3 feet, which held large teeth of varying shapes reminiscent of the maw of the modern Hippopotamus. Daeodon had blunt conical tusk-like canines at the front of its jaws and flat ridged chewing teeth at the back. This interesting dentition suggests the animal may have been an omnivore, shuffling through foliage and preying on small animals. This hell-pig, as it has been popularized, had pig-like feet ending in a two-toed hoof and a large scapula that would have been the attachment point for lots of muscle. A part of what made it so strange, or ugly depending on how you look at it, were the cheekbones. This animal, and its entire family, had protruding cheek phalanges with blunted or rounded tips. These animals have often been reconstructed with these bony struts as crest-like protuberances; however, these were likely similar to the bony struts seen in an hippopotamus skull—that is, flesh, fat, muscle, and tendon covered much of these cheekbones and points in life and they may have even been attachment sites for facial tissue. We have aYoutube channel choke full of videos on paleontology and related sciences, go check it out and subscribe! Triceratops is undoubtedly one of the most well-known, and well-loved, members of Dinosauria. It is second only to its predator, Tyrannosaurus, and fits into the small niche of popular prehistoric animals, including; Stegosaurus, Brontosaurus, and Velociraptor. Triceratops is known far and wide due to its great fossil distribution and the intensive study of its fossil remains. Triceratops is a main staple in museums, right alongside Tyrannosaurus. However, there are definitely some parts of Triceratops that are not as they seem, and will remain a mystery sealed by the marching of time. The first specimen of Triceratops, referred to as the holotype, was discovered in Denver, Colorado in 1887 and consisted of two brow horns attached to a bit of the skull roof. This important and unusual specimen got sent to paleontologist, Othniel Charles Marsh, who upon first investigation, thought they belonged to a large bison from the Pliocene. As a result, he named this first specimen Bison alticornis (Carpenter, 2007, pp. 353-360). It was only after uncovering and naming the remains of another horned dinosaur (Ceratopsians) that Othniel Charles Marsh realized the bison-like horns he received were from a dinosaur of similar type. Due to lumping fossils with even the slightest similarity into the same genus and species, Marsh assigned his horn specimen to the genus Ceratops (Marsh, O.C. 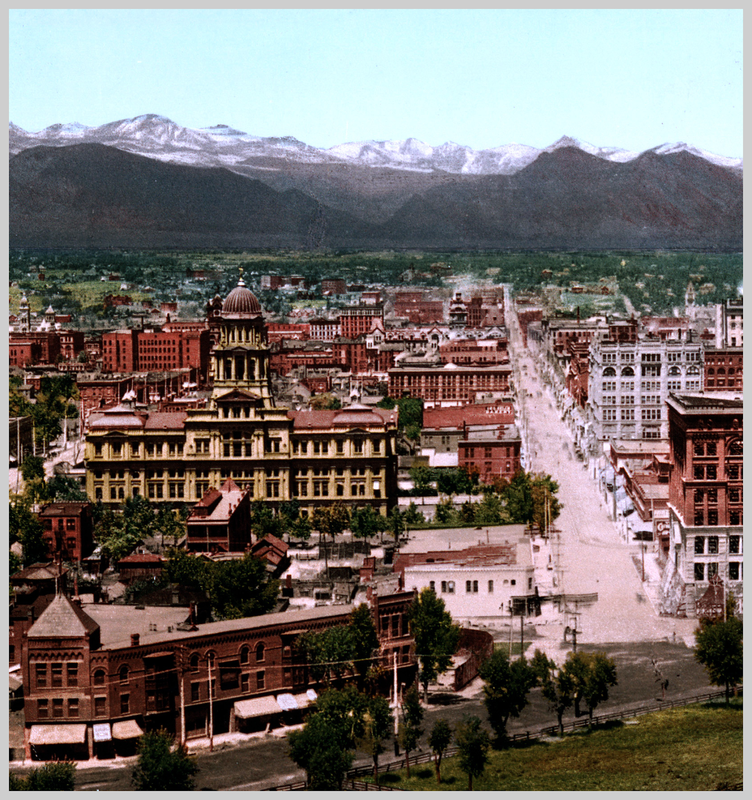 1889, pp. 173–175). Paleontologist, John Bell Hatcher, discovered another horned fossil in 1888, which was far more complete than Othniel Marsh’s horns. 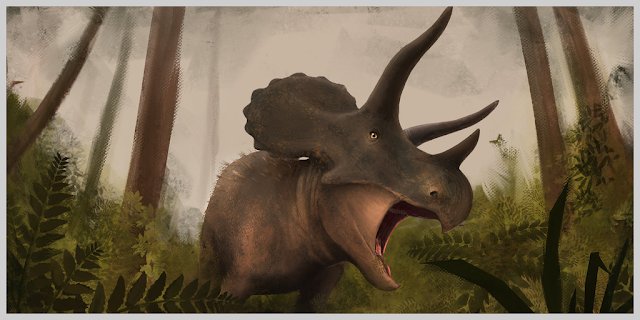 This discovery was distinct enough to warrant a new genus and thus, Triceratops was borne. The B. alticornis material retained the name Ceratops montanus until it was found to be a nomen dubium. 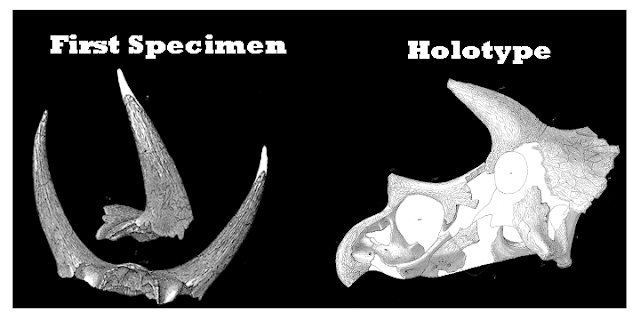 The B. alticornis material is now considered synonymous with Triceratops, but more remains are needed to determine the exact taxonomic status of the horn fossils. Many of the specimens discovered show such variation that an incredibly long list of species began to pile up. In the 1930s, scientists started organizing these species by joining morphologically similar specimens together. This resulted in the list of; T. horridus, T. prorsus, T. brevicornus, T. elatus, T. calicornis, T. serratus, and T. flabellatus. 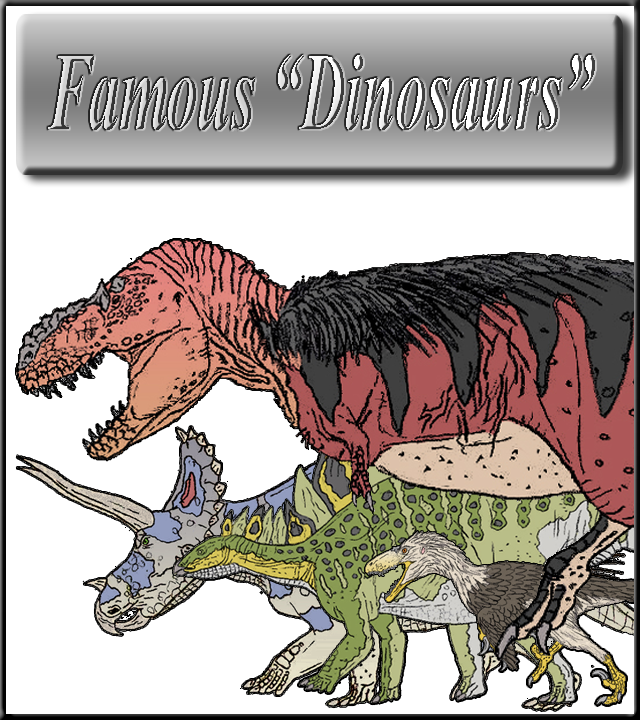 In 1983, paleontologists, John Ostrom and Peter Wellnhofer, co-wrote a paper describing their theory suggesting the existence of only one species of Triceratops, T. horridus, making all the existing species synonyms (Ostrom, J. H.; Wellnhofer, 1986, pp. 111-158). All of the work done on the Triceratops skulls to decide what went to which species was looked into again by Catherine Forster, who hypothesized there were only two separate species consisting of T. horridus and T. prorsus (Forster, 1996, pp. 259-270). This latest phylogenetic organization has held up and is widely accepted to this day. Triceratops’ fossil record does not stop there; however, as a controversy regarding a close cousin has erupted in recent years. Torosaurus is another ceratopsian dinosaur of the late Maastrichtian stage of the Cretaceous period (approx. 68-66 MYA) found across the Western Interior of North America (from Saskatchewan to southern Texas). It lived in the same time and place as Triceratops and, oddly enough, looked remarkably similar. 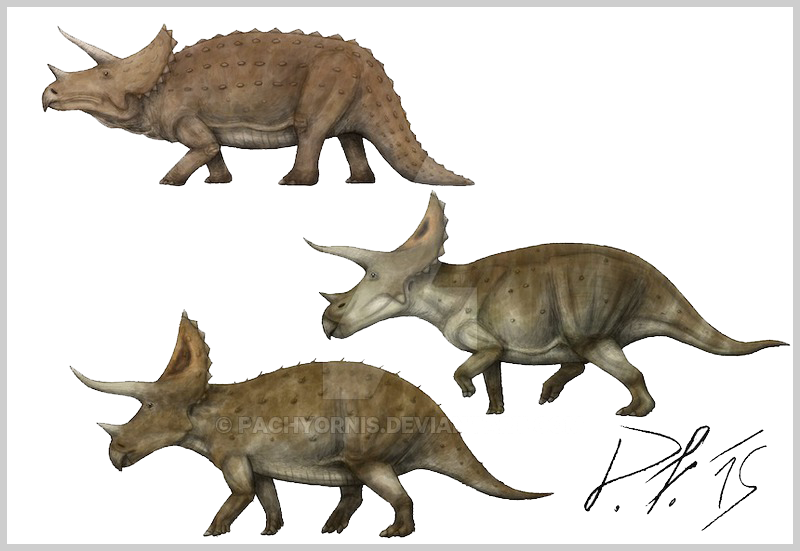 The main difference between the two genera is Torosaurus’ skull was larger, longer, and had symmetrical perforations in the frill. Recent findings might suggest the two are one and the same. 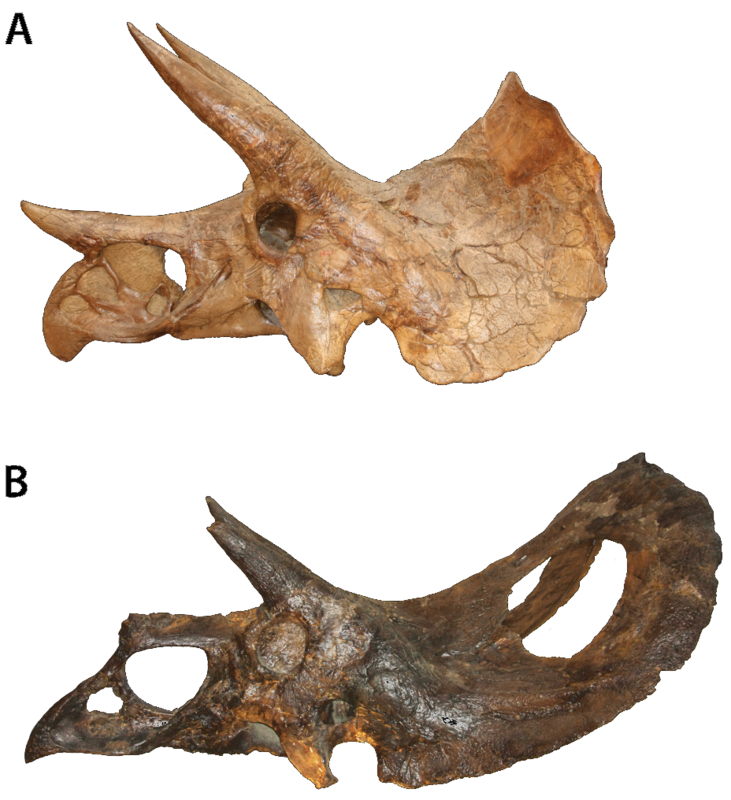 Paleontologists, John Scannella and Jack Horner, have presented a hypothesis suggesting since the bones making up the skulls of the two ceratopsians were metaplastic or ‘stretchy’, the skull would change shape as the animal aged. 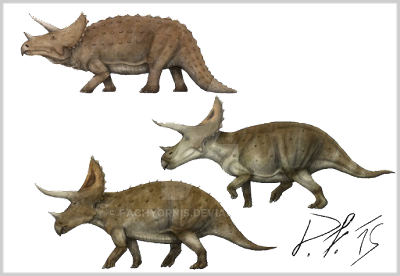 If this is the case and both animals lived in the same time and place and shared remarkably similar anatomical similarities, Jack Horner and John Scannella suggest Torosaurus is a specimen of Triceratops advanced in age past what we recognize as an adult Triceratops. Since the only evidence for synonymy is skull material, there has been debate over Horner and Scannella’s findings (Scannella, J.; Horner, J.R., 2010, pp. 1157–1168). In 2011, Andrew Farke disputed Scannella’s hypothesis by arguing the fossil record of both animals showcase specimens of Triceratops too mature to represent immature individuals and Torosaurus specimens too immature to represent an elder synonym of Triceratops (Farke AA, 2011, pp. PLoS ONE 6(1)). This debate has yet to conclude and further specimens are needed before it can be laid to rest. Triceratops can easily be considered the bison of the Cretaceous for more reasons than one. Triceratops sported three solid bony projections from its skull, two horns above the eyes, and one on the tip of its snout. It also sported a large curved beak like that of an eagle or parrot (Castro, 2016). The second most distinguishing feature of Triceratops, excluding the horns, is its solid bone frill sticking out from the back of the skull. 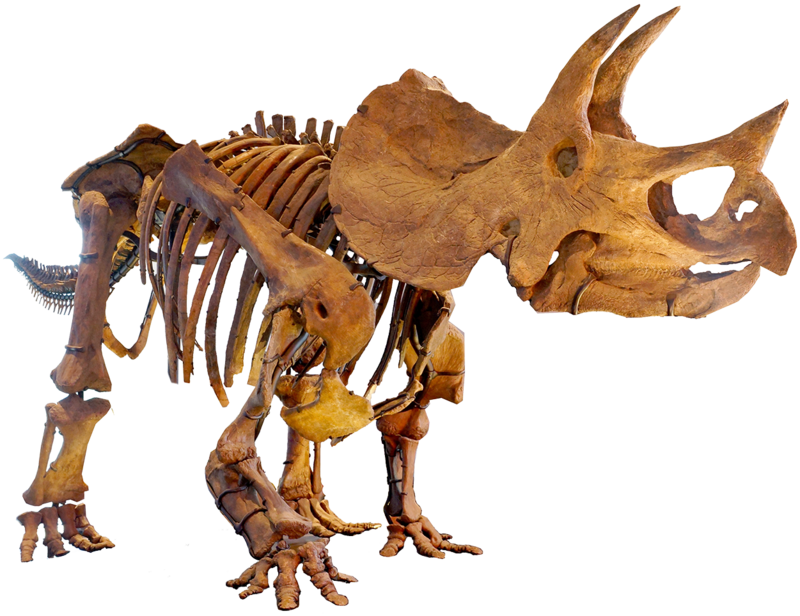 Unlike nearly every other ceratopsian, Triceratops’ neck frill is solid bone and structurally strong. Some specimens have been found with triangular osteoderms, bone armor under the skin, on the edges of the frill. This may very well point to the idea that Triceratops, and only Triceratops, evolved its frill differently from other ceratopsians to include both display as well as defensive functions. All other ceratopsians posses holes of varying sizes and shapes in their frills, and some even bear preserved impressions of blood vessels, adding evidence the use of the frill as a display organ to each other and the world around them. Paleontologist, Andrew Farke, suggests Triceratops used its horns in conspecific and defensive ways as opposed to only display. 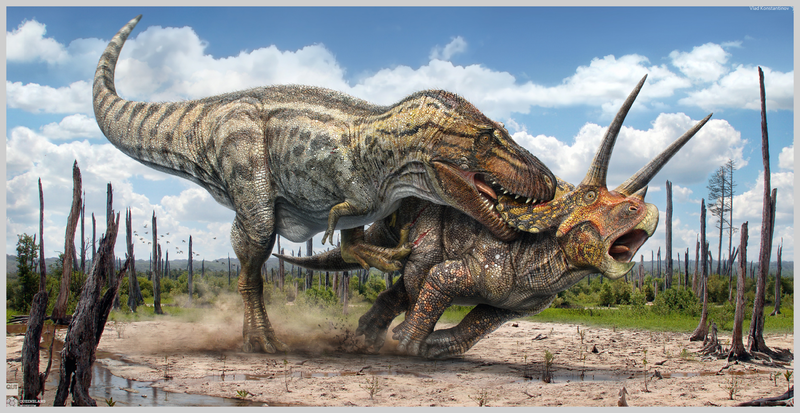 Farke compared the skulls of Triceratops and Centrosaurus, a smaller earlier ceratopsian, to determine whether the frequency of lesions of the skulls pointed to use in fights. 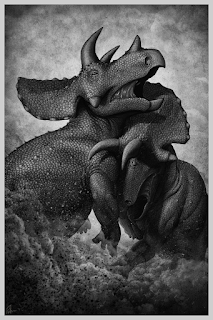 Triceratops’ skulls have a large solid frill and two forward facing horns, while Centrosaurus had open frills and a long upward pointing nasal horn. His study found that Triceratops skulls show substantial frequency of lesions to the squamosal bones, the lowest outward pointing part of the frill, where repeated combat between members of the same species would manifest these symptoms. 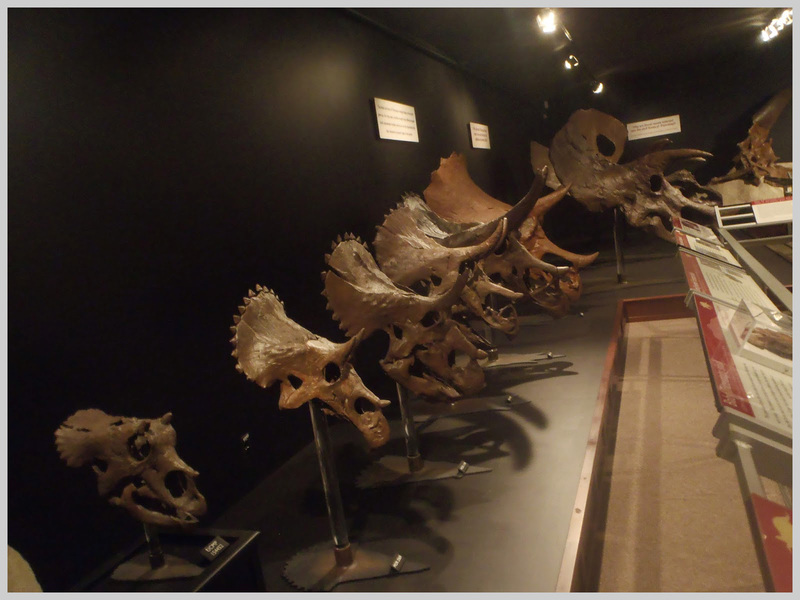 Whereas the Centrosaurus skulls showed far less pathologies, or evidence of injury, in their skulls pointing to there use more as display organs than Triceratops (Farke, Wolff, & Tanke, 2009). The overprotective armor of Triceratops would account for why Tyrannosaurus, the top predator of Triceratops’ ecosystem, had such powerful bone crushing teeth. Triceratops’ physiology is simple to understand, the dentition consisted of 36-40 teeth packed closely together in batteries and their shape suggests an herbivorous lifestyle. Triceratops’ body was low-slung, and as such, it would have fed on palms, cycads, and ferns. Triceratops took the niche of the low-browser which put it out of competition with the animals of its environment. The animals in the ecosystem of Triceratops include; Tyrannosaurus, Acheroraptor, the newly discovered Dakotaraptor, Struthiomimus, Ankylosaurus, Thescelosaurus, Edmontosaurus, and Pachycephalosaurus (Pearson, Schaefer, Johnson, Nichols, & Hunter, 2002). Being so widespread across the continent, Triceratops would have lived in many different biomes like forests and open woodlands. 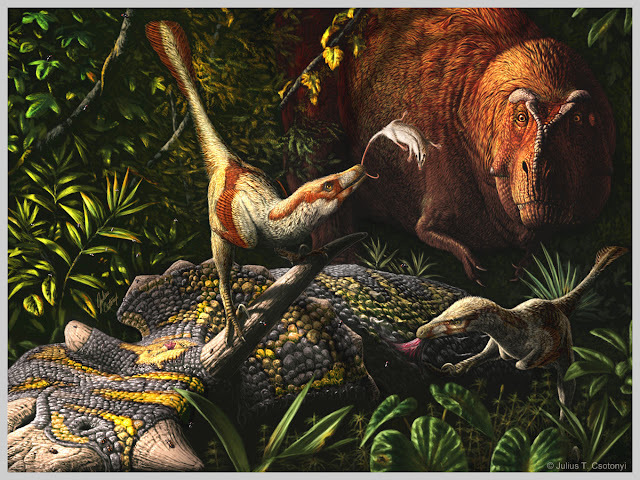 The top predator of Triceratops and most animals in the Hell Creek Formation was likely Tyrannosaurus. 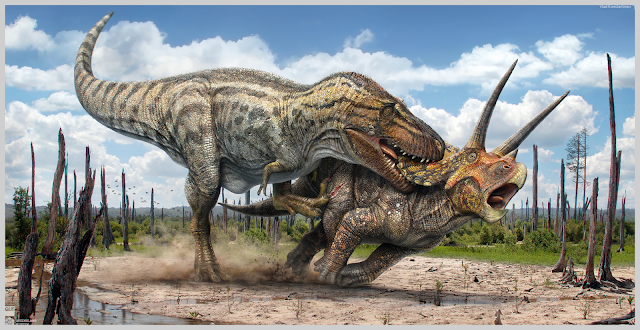 Tyrannosaurus had especially adapted to take down well-armored prey like Triceratops and Ankylosaurus and found relative ease in taking down sick/dying, old, or young individuals. Triceratops' appearance has changed many times over the decades and quite drastically each time. Originally, it was depicted, as all other members of Dinosauria were, as large, slow, squat reptiles dawdling along the bleak landscape looking for their next meal. The original look of Triceratops consisted of a square trunk, tail pointed downwards and dragging, the front limbs squat like a reptile, and the teeth in the mouth fully visible. Then when the ‘Dinosaur Renaissance’ occurred (1960s-1990s) the thought of Dinosaurs changed from slow moving reptiles to fast moving, warm-blooded ancestors to modern birds. The look of Triceratops looked close to how it does today with a round body, well proportioned head, arms and legs placed directly underneath the body, with a tail held firmly off the ground. However, new evidence, plus the subsequent ‘anti-shrink-wrapping’ movement (adding soft tissue to extinct animals as though they are real animals), has changed the idea of the 1980’s Triceratops by adding speculative porcupine-like quills to the rear end of the animal and random placement of hexagonal scales around the dorsal side of the animal. Although Triceratops has changed drastically throughout the years, it has continued to stay one of the most popular and well-loved dinosaurs of all time like Tyrannosaurus, Stegosaurus, and Parasaurolophus. Carpenter, K. (2007). Horns and Beaks: Ceratopsian and Ornithopod Dinosaurs. Bloomington, IN: Indiana University Press. Marsh, O.C. 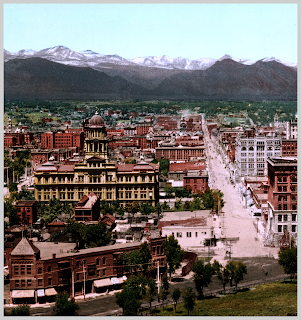 (1889b). Notice of gigantic horned Dinosauria from the Cretaceous. American Journal of Science. 38. Ostrom, J. H.; Wellnhofer, P. (1986). The Munich specimen of Triceratops with a revision of the genus. Zitteliana. 14. Scannella, J.; Horner, J.R. (2010). Torosaurus Marsh, 1891, is Triceratops Marsh, 1889 (Ceratopsidae: Chasmosaurinae): synonymy through ontogeny. Journal of Vertebrate Paleontology. 30 (4): 1157–1168. doi:10.1080/02724634.2010.483632. 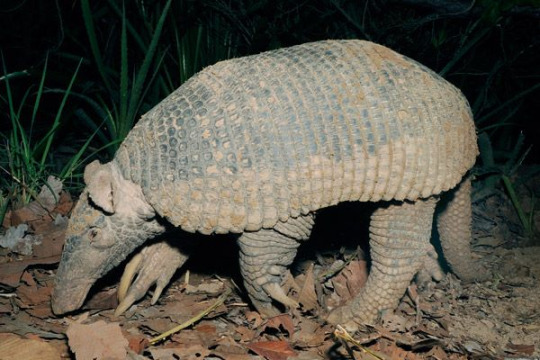 The giant armadillo, as you can guess based on its name, is the largest armadillo still in existence (We shall say nothing of their ancient spheroid relatives). 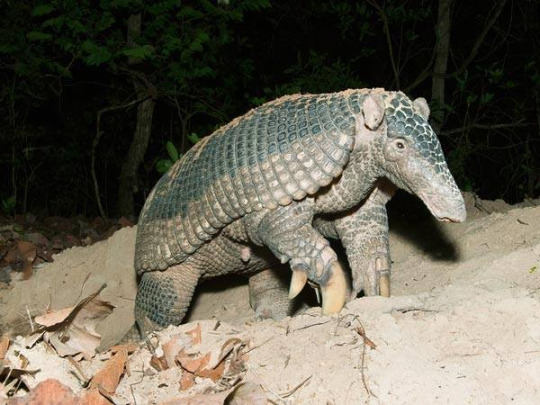 They can weigh around 40-180 pounds when fully grown and have up to one hundred teeth, which surprisingly, is the largest amount of teeth of any terrestrial mammal. Instead of rolling up into balls, they burrow to protect themselves. Although they eat other creepy crawlies, like spiders, they prefer to munch on ants and termites. To come forth and be a part of our project. Each and every one of our articles will one day be a part of an encyclopedia series about life on earth. We are in need of as many authors as possible, as well as images of skeletal remains, life-size models, photographic evidence of existence, etc. from anyone who has it. Fill out our messaging form and we will get to you as quickly as we can, and that is QUICK!